The party’s at your house this year! After all, there’s no better way to ring in the new year than with those who know and love you best. If you’re anxious about hosting a party on short notice, relax. It can be simple, fun and family-friendly. Read on for ideas. Yes, it can be easy! Pare the party down to its essential elements — decor, food and drink, and guests — and plan from there. Balloons = instant fun. Decorate with a rainbow of hues, or go monochromatic for a more stylized theme. Add glow sticks! 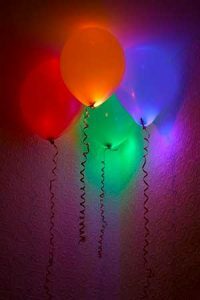 Or surprise your guests young and old with a balloon drop. Glitter makes everything more festive. Strategically place these do-it-yourself (DIY) glittery votives around your party space, and set the evening aglow. Hang paper snowflakes from the ceiling or light fixtures for the perfect touch of whimsy to your party decor. Repurpose your Christmas tree as a decoration-worthy New Year’s tree. Added bonus: It’s an instant “activity station” for guests. Use those glittery and metallic Christmas ornaments to create festive centerpieces. The options are endless! Make it a potluck, purchase appetizers and snacks, cater your own party, or incorporate all three. If you’re feeling the DIY vibe, there’s no shortage of cookbooks available through the library, like these. Simply break out your library card! 50 Great Appetizers (by Pamela Sheldon Johns): Recipes categorized according to cooking method. The Ultimate Appetizers Book: Recipes for more than 450 party foods and drinks, plus tips for entertaining. And you can download it! Gather: The Art of Paleo Entertaining (by Hayley Mason): Menus for a variety of occasions organized by season, following the paleo diet plan. Barefoot Contessa Foolproof (by Ina Garten): Simple recipes and invaluable tips. 101 Champagne Cocktails (by Kim Haasarud): Light, fresh concoctions that bring people together. Downloadable! Martha’s Entertaining (by Martha Stewart): Inspired recipes for gatherings ranging from simple to lavish. Your party, your guest list! You know your friends and family best, so invite wisely — and lively. Every great New Year’s party calls for an awesome playlist. And you can create one through the library, using just your library card. Download classic party songs or New Year’s hits from Freegal, or stream rockin’ New Year’s tunes through Hoopla. Get the party started! Not sure how well your guests will mix and mingle? Want to avoid the topics of weather and politics? Try a classic DIY version of 20 Questions to get the conversations started. Provide pre-cut note paper and ask guests to write down their New Year’s resolutions. They could fold them up and place them in the balloons decorating the New Year’s tree. Take it a step further by giving your guests their written resolutions in the new year as a reminder. Ask guests to write down their predictions for 2017 — no names attached! Place all predictions in a fish bowl, pluck them out throughout the night, and have everyone guess whose prediction belongs to whom — prizes optional. You can buy inexpensive favors at any party store or dollar store. 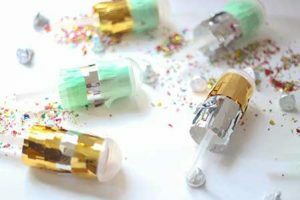 But you can also make a fun craft project out of creating your own, like tissue paper confetti poppers or New Year’s noisemakers. The benefits of this New Year’s countdown clock are twofold: It’s a creative project for the littles and it helps them keep track of the impending New Year. Focus their attention on their New Year’s reflections. There’s a teen version and one for the youngsters among you. 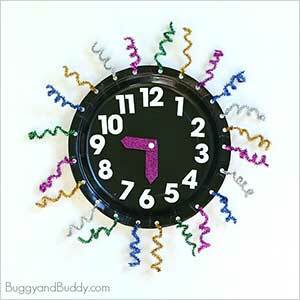 Get the kids thinking about their wishes for the new year by making a wishing wand. And who doesn’t love bling? These fireworks rings might even be a hit with the moms! Want more party planning ideas?